ປະເທດສະວີເດັນ (ກະເລັກ: Sweden, ຝະລັ່ງ: Suède) ແມ່ນປະເທດຫນຶ່ງທີ່ຢູ່ໃນທະວີບເອີລົບ. ຫຼື ລາຊະອານາຈັກສະວີເດັນ (ຊູແອດ: Konungariket Sverige, ຝະລັ່ງ: Royaume de Suède) ເປັນປະເທດກຸ່ມນອກດິກຕັ້ງຢູ່ເທິງແຫຼມສະການດິນາວີ ໃນເອີລົບເໜືອ ເຂດແດນທາງຕາເວັນຕົກຕິດກັບປະເທດນໍເວ ທາງຕາເວັນອອກສຽງເໜືອຕິກຕໍ່ປະເທດຟິນແລນ ແລະຊ່ອງແຄບ ສະແກເກີແລກ (Skagerrak) ທາງຕາເວັນຕົກສຽງໃຕ້ຕິດກັບຊ່ອງແຄບແກຕີແກດ (Kattegat) ແລະທາງຕາເວັນອອກຕິດກັບທະເລບານຕິກ ແລະອ່າວບົດນີ. ມີສະຕອກໂຮມເປັນນະຄອນຫຼວງ. ປະເທດສະວີເດັນມີປະຊາກອນທີ່ເບົາບາງ ເວ້ນແຕ່ໃນເຂດເມືອງໃຫຍ່ ພື້ນທີ່ສ່ວນໃຫຍ່ຂອງປະເທດປະກອບດ້ວຍປ່າໄມ້ ແລະພູສູງ. ພາສາລັດຊະການຂອງປະເທດສະວີເດັນແມ່ນພາສາສະວີເດັນ ເຊິ່ງມີຜູ້ເວົ້າເປັນພາສາແມ່ໃນປະເທດປະມານ 8,840,000 ຄົນ (ປະມານ 92% ຂອງປະຊາກອນປະເທດ) ແມ່ນພາສາທີ່ຈັດຢູ່ໃນຕະກູນພາສາເຢຍລະມັນເໜືອ ແມ່ນພາສາທີ່ຄ້າຍຄຶງກັບພາສາເດນໝາກ ແລະພາສານໍເວ ໂດຍຜູ້ເວົ້າທັງສາມພາສານີ້ສາມາດສົນທະນາກັນໄດ້ ເຖິງແມ່ນວ່າຈະມີການສະກົດແລະສຳນຽງການເວົ້າທີ່ແຕກຕ່າງກັນແດ່. ↑ "Population Statistics". Statistics Sweden. ສືບຄົ້ນເມືອ 8 October 2014. ↑ "Folkmängd 2013". Statistics Sweden. ສືບຄົ້ນເມືອ 19 February 2014. ↑ "Sweden's population hits 9 million". Statistics Sweden. ສືບຄົ້ນເມືອ 8 June 2013. ↑ "More than 9.5 million inhabitants". Statistics Sweden. ສືບຄົ້ນເມືອ 8 June 2013. ↑ "Språklag (2009:600)". Riksdagen (ໃນ Swedish). 2009-05-28. ສືບຄົ້ນເມືອ 10 November 2014. ↑ Landes, David (1 July 2009). 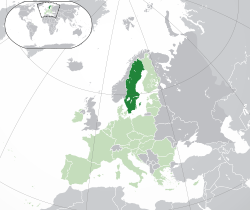 "Swedish becomes official 'main language'". The Local. thelocal.se. ສືບຄົ້ນເມືອ 15 July 2009. "Radical principles and the legal institution of marriage: domestic relations law and social democracy in Sweden—BRADLEY 4 (2): 154—International Journal of Law, Policy and the Family". ສືບຄົ້ນເມືອ 2007-06-13. "Sweden's population 2012". Statistics Sweden. ສືບຄົ້ນເມືອ 2013-03-24. Sawyer, Birgit; Sawyer, Peter H. (1993). Medieval Scandinavia: from Conversion to Reformation, Circa 800–1500. University of Minnesota Press. ISBN 0-8166-1739-2. "Preliminary Population Statistics, by month, 2004–2006". Statistics Sweden. 1 January 2007. Yearbook of Housing and Building Statistics 2007 (PDF). Statistics Sweden, Energy, Rents and Real Estate Statistics Unit. 2007. ISBN 978-91-618-1361-2. ໜ້ານີ້ຖຶກແກ້ໄຂຄັ້ງລ້າສຸດເມື່ອວັນທີ່ ໑ ມັງກອນ ໒໐໑໙, ເວລາ ໑໐:໓໐.